Toenails fall victim to fungal infections that cause thick, brittle, and white or yellow nails. The fungus goes after the nail or the nail bed through cracks or cuts around the nail or between the nail and the nail bed. A dermatophyte causes most cases of athlete’s foot. Athlete’s foot can infect toenails. Dermatophytes on clothing, nail files or clippers, locker or shower room floors, pool decks, towels, and carpets can pass through contact to a person’s skin and on to the nails or nail beds. Yeast overgrowths due to illness or antibiotic use can cause a yeast infection that leads to a fungal nail infection. Molds are usually not passed from person to person. One must be susceptible to getting fungal infections in order for them to develop. Toenail fungus most likely affects those over 60 years of age; diabetics or those with weak immune systems; those who have a nail injury; or those who live in a humid and hot area, especially if they wear shoes that make the feet moist. A fungal nail infection can make it difficult to wear shoes, walk, or stand for a long period of time. Other symptoms depend upon the type of infection present. Athlete’s foot may be present. Yellow streaks may be in the nail bed and underneath the nail. White spots or streaks may be on the surface of the nail. The nail may be brittle, thickened, discolored, and separated from skin under the nail. There may be skin and nail fragments under the nail. In the worst of cases, a damaged nail surface could be brown or gray, powdery and soft, yet not separated from the skin. Dr. Burmeister will diagnose a fungal toenail infection by observing the nail and asking about the symptoms and your health history. Because medication for one type of fungus may not have an effect on another type of fungus, it is important to do every level of testing necessary to identify the fungus causing the infection. Dr. Burmeister may get samples of skin and nail fragments for in-office testing or for doing a fungal culture. In rare cases, he may want to do a nail biopsy. If not treated, a toenail fungal infection will not go away. It might even get worse. Dr. Burmeister will discuss treatment options with you. Antifungal medication is the usual treatment. Oral medicines are most effective. Topical medications that are applied to the nail and surrounding skin area are less effective in eradicating the fungus. They are, however, helpful in preventing the spread or reoccurrence of the fungus. 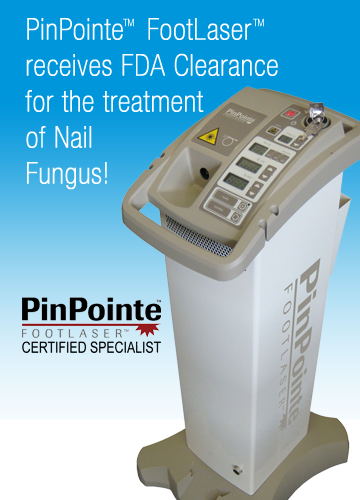 Toenail fungal infections can return even after successful treatment. To prevent them from happening in the first place or from reoccurring, these steps should be taken. Keep your feet dry. If necessary, dust them with powder. Thoroughly wash and dry feet before going to bed. Apply a topical antifungal per Dr. Burmeister’s instructions. Wear sandals or shoes that are roomy and made of materials that let moisture escape. Let shoes dry out between wearings. Wear cotton or wicking socks. Change them if they get wet. When in wet public areas such as showers, pools, or locker rooms, wear shower footwear. Let shoes dry out between wearings. Do not share personal items such as nail clippers or files, socks, shoes, or towels. Do not cut nails too short. Avoid injuring them by any means possible. Diabetics should be extra cautious, taking special care of the feet. If you experience symptoms of toenail fungus, Dr. Jeffrey Burmeister, DPM, and his experienced staff are ready to fully diagnose, treat, and see you on your way to pain-free living.